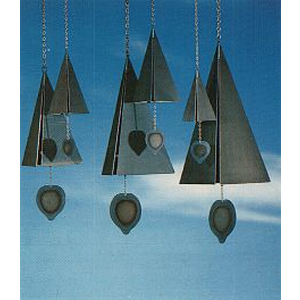 Wind Works are one of our most popular bell chimes. Wind Works are triangular in shape and made out of Corten steel. Wind Works are a hybrid between a chime and bell in that they produce a bell like gong, yet have three tones making them a chime of sorts. Over time, the bells weather to a dark rust color and a protective coating forms. Wind Works provides a lifetime guarantee on moving parts. The bells are designed to ring gently in the wind and can be shut off. They come in six sizes, three Regular Bells and three Super Bells.